The Demons were football’s best show at the start of last September, and so they have been again this March and April. It’s a completely different show now, of course, a fully realised catastrophe that you can’t take your eyes away from. It’s compelling to watch a team build and find itself, and even more so to see it disintegrate and lose everything. That’s where Melbourne are now – on the precipice of sweet disintegration. If they don’t win on Thursday night against a mediocre Swans outfit, their season will be essentially over. The Dees are almost artful in their lack of rhythm right now, a destroyed canvas of what should have been. Everything that came easily to them is now impossibly difficult. You can pinpoint specifics – Tom McDonald is lost and the forward line has no structure, the defence is leaking goals, and forward entries are being butchered by poor skills and a lack of imagination – but to single out particular reasons is to undermine the broader disaster; that this team just isn’t there right now. The Demons were so present in the second half of last year. More than any other team, you felt their physicality from the screen, James Harmes and Clayton Oliver smashing into some more bodies and coming off best. Melbourne weren’t the most polished and didn’t always run both ways, but they were, you felt, the most physical team in the contest, and somehow that registers with us more than anything else. If you can dominate at the coalface, you will always be feared. They have been lacking in the contest this year, but it’s everything after the contest that has doomed them into farce. They look like they can’t run, can’t fight, can’t resist. The opposition is moving the ball at will on them – Essendon, a team that couldn’t manage ten goals in Rounds 1 or 2, got to 20 against the Dees and left a few more on the table. In the second quarter against the Dons, Melbourne burst into life, as if finally triggered by the awareness that they were so close to death. They looked like themselves. When they are on, there is something unmatched about the magnetism of their ferocity, where they look like a controlled football avalanche, crushing and overwhelming opponents. They’re bruising at stoppages, frenetic in spreading forward, and the opposition players seem like unfortunate, meek bystanders unwittingly thrown into the vicious Melbourne pinball machine. All of this came back briefly in that second quarter. Oliver, Harmes, Jack Viney and Angus Brayshaw dominated around the ball, Max Gawn took contested marks and Christian Petracca, who is everywhere or nowhere with no in-between, tapped into ‘everywhere’. 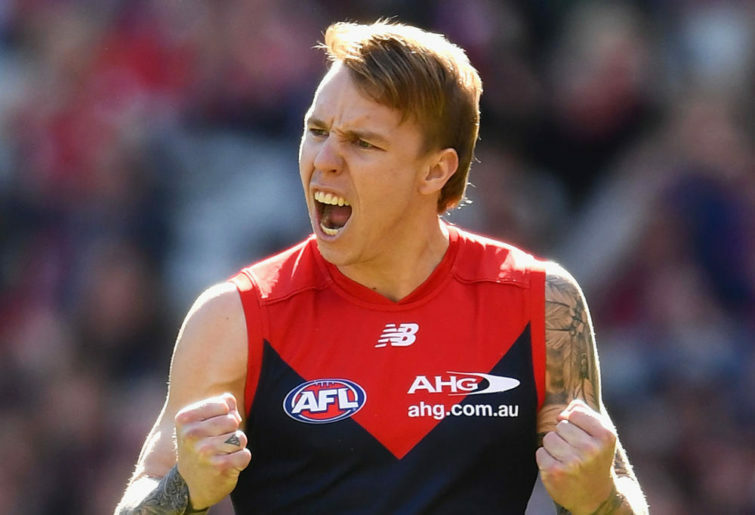 Seven goals to two and the Demons turned a disaster into a rebirth. But then they quickly reverted, disaster catching up to them in the third term, with form completely flipping, as Essendon kicked seven goals to their two. At that point, and as Melbourne failed to mount anything beyond a token comeback in the fourth quarter – a drowning team rising up for a last breath of air, the body already far too weak to swim back to shore – it became clear: the second quarter is not who Melbourne are, only who they were. All this can change. All the personnel that made Melbourne seem as complete a team as any a month ago is still, for the most part, intact. There are a few key deficiencies. You dream of Steven May and Jake Lever but then wake up to Oscar McDonald and Sam Frost, the latter who is just not up to it. Tom McDonald needs to be the force he was last year, Gawn and Viney need to rediscover themselves, and Petracca needs to make the leap now. Everything is broken. The Demons look unfit and more than anything, completely unsure. This team has melted down on their biggest stage each of the last two seasons. It was expected that Melbourne’s next test, the next opportunity to emphatically meltdown or finally prove their point, would come deep into September. Instead, it comes in early April. From MSG in New York to the MCG in Melbourne, Jay has spent his adult life travelling the world, indulging in sport and approaching it from the angle of history and pop culture.